EasyJet has posted a 41% jump in annual profits, despite being hit by surging costs and strike disruption. The low-cost airline reported pre-tax profits of £578 million for the year to September 30, up from £408 million in 2016. But the budget carrier warned it expects cost pressures to increase this financial year, with a hit of up to £100 million anticipated from rising fuel prices. It also said it expects revenues to fall in the first half of this financial year due to various factors including the timing of Easter. 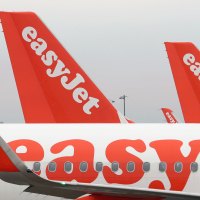 EasyJet said it is continuing to prepare for Brexit, having set itself up across Europe to be able to operate via airlines in the UK, Switzerland and Austria to enable ongoing flying in the EU. It said: "Both the EU and the UK have said their objective is to maintain flights between the EU and the UK, whatever the Brexit outcome. Full-year results showed the group flew a record number of passengers, up 10.2% at 88.5 million, with total revenues up 16.8% to £5.9 billion. Reported pre-tax profits rose to £445 million from £385 million the previous year. EasyJet also booked a £112 million underlying loss from its operations at Berlin Tegel Airport in Germany. But it admitted "disruption has been a major factor", with cancellations up significantly to 6,814 from 2,502 the previous year. The airline industry was rocked by strike chaos over the summer as a result of air traffic control industrial action in France and Italy. Chief executive Johan Lundgren said: "EasyJet has delivered a great performance during the year, growing headline profit before tax by 41%, once again flying a record number of passengers at our highest ever annual load factor. "While disruption continues to be a major challenge for the industry, we are investing in resilience to help to mitigate the impact on our customers," he added. The group also said that, despite Brexit, UK consumer demand remains strong with bookings for next summer ahead of 2018's pace. It said forward bookings for summer 2019 are "slightly ahead" of summer 2018. If you're planning a city break this winter, why not get the right cover for you with our dedicated city breaks travel insurance and give yourself peace of mind.